Ballina has several beaches, with the most popular in the north of the town. 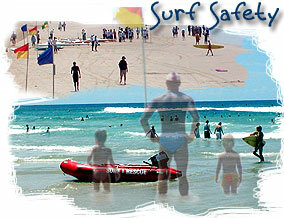 Shelly Beach is a patrolled beach, also popular are Lighthouse Beach and the pretty swimming beach at Shaws Bay Lagoon. The coastline is a beach lovers dream with sheltered coves, vast ocean beaches and some of the world’s finest surf breaks. 32km of white beaches from Ballina to Lennox Head await you. Relax along the coastline which has been regenerated by local dune care groups. Click here for more information on Surf Safety. Click on the 'QUICK VIEW' icon beside pic to view a pop-up presentation of the featured beach, cove, lake or lagoon. From Blackhead to Flat Rock is not only one of the prettiest beaches on the north coast but a green corridor of native plants and trees cared for and conserved by local Dune Care and Coast Care groups. Named after the boulders and stones that line its edge this area is not only a well known surfing spot but its grassy southern point with magnificent views has hosted many a north coast wedding. Explore the fascinating world of unusual and beautiful creatures that call this unique rocky platform home. Adjacent to the Flat Rock Tent Park this area remains a favourite for weekend and short term campers. A fresh water lake stained by the tea trees that line it banks this favourite shady spot is a great family swimming and picnic area with easy access to the surf just north of the village of Lennox Head. World renowned for its right hand point break. When 'The Point' is breaking, expect to see the worlds best taking it on.The headland is a great place to view the annual whale migration, with views for miles. Also known as the "moat" or the 'boat channel' , Lennox Reef covers 2.5 hectares and 1.5 km's along Seven Mile Beach. The reef, directly in front of the main street, contains a vast variety of marine life and is a favourite snorkelling spot. Also known as Main Beach by the locals it is a great surfing and swimming area patrolled by lifeguards and volunteers from September to the end of the Easter break. Take the ferry to South Ballina and head to the south wall and you will discover a great family swimming spot at low tide. Take a leisurely walk from the Shaws Bay Caravan Park to Lighthouse Beach. Sit and enjoy the expansive view of the river mouth. Discover the many moods of the river and meet the pelicans and spot the dolphins that call this waterway home. Fishing, sailing, skiing or just taking in the view is always a pleasure. 4WD access from the northern end to the Byron Shire Boundary. Dogs are also allowed north of the Lake Ainsworth Reserve, with effective control. Sandy beaches and seclusion await you behind the South Wall with great swimming, fishing and surfing. 4wd access and dogs allowed. A well known surfing area, this beach is patrolled in the summer holidays as it grows in popularity. Dogs permitted on leash only. A calm family swimming spot with shade and picnic facilities. An easy walk across the North Wall leads to another favourite picnic park and swimming cove of the Richmond River. A wading pool at Shelly Beach has been built into the rocks and is perfect for toddlers. The beach is patrolled in school holidays. This sandy area along the banks of North Creek offers a refreshing swimming area and, with its large areas of shallows, is a favourite family area. Enjoy excellent land based whale watching from May - October as the magnificent humpback whales make their annual migration. Surfing is a passion for many who live in and visit the area and the weather plays an important part all year round. View some information and things to do at our famous neighbouring town of Byron Bay.